New from Maple Leaf Magic is a great utility prop suitable for a variety of audiences! 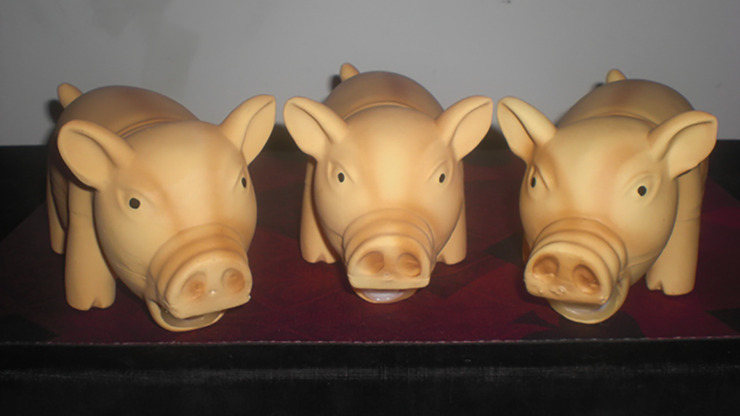 1) The Traditional Monte: Show that one piggy oinks and the other two are the "strong silent" types! Mix them up and ask the audience member to keep track of the squealer. Of course, they cannot... that is, unless you want them to! 2) Reverse Monte: The spectator always finds the squeaky piglet, and you become more and more frustrated as you fail! 3) Psychic Piggy: Piggy can find a card chosen from a deck and will "squeal" when he is passed over it! This prop has multiple uses and is really great for many types of audiences. Kids performers... you have a great beginning to a Three Little Pigs type of routine! Adults, especially women, find the pigs cute. And of course, I'm sure you extreme performers could find some racy ideas with these!!! Each piggy is about 6 inches long, 2 1/2 inches high 2 1/2 inches wide, and made of soft rubber so they're virtually unbreakable. Comes with instructions. You'll have fun with Oinkers Away!